Raafat M.A. El-Bakary, El-said E. Enany, Ashraf A. Karkoura, Mohamed M.A. Abumandour, Sara F. Gafaar. 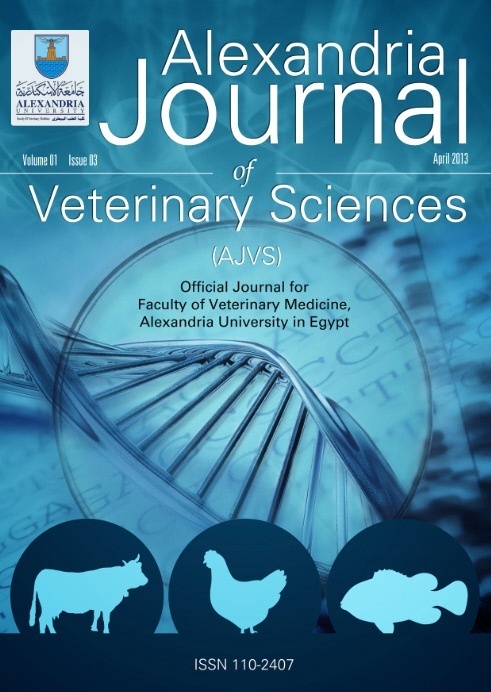 The current investigation gave full histological description of the nasal conchae cavity of dog captured from Egypt. In vestibular part of nasal conchae, epithelial lining was keratinized stratified squamous which interdigitated with the underlying lamina propria. There were numerous compound sero-mucous glands. In middle respiratory part of nasal conchae, epithelium consisted from pseudo-stratified squamous with goblet cells. The main component of the lamina propria submucosa was fibro elastic C.T. The glands were mainly present in the side of the outer covering mucosa. In the dorsal nasal concha, they were simple sero-mucous glands, few in number and scattered under the lamina epithelialis of outer side. In caudal olfactory portion of nasal conchae, epithelium was comprised three cell types; basal cells, supporting (sustenticular) cells and bipolar (olfactory) cells. The lamina propria submucosa consisted of loose C.T of collagenous and delicate elastic fibers with lymphocytic infiltration and variable numbers of mucous glands.